Sydney's Fashion Diary: CLOSED - Club Couture $25.00 gift card giveaway! CLOSED - Club Couture $25.00 gift card giveaway! The winner of last week's giveaway is...MommyBee. Please contact me to claim your prize. Congrats! Onto this week's giveaway, there will be TWO winners chosen!!! Prize # 1: Club Couture just launched the "She dreams of the country" collection last month. This collection was inspired by the Côte d'Azur. It brings together a classic meld of sweet romance, love for the countryside and effortless style. To celebrate this exciting news, Club Couture has kindly offered one of my lucky readers a $25.00 gift certificate to use towards any purchase. Just in case you missed my previous post, I am modeling the purple halter maxi dress here. 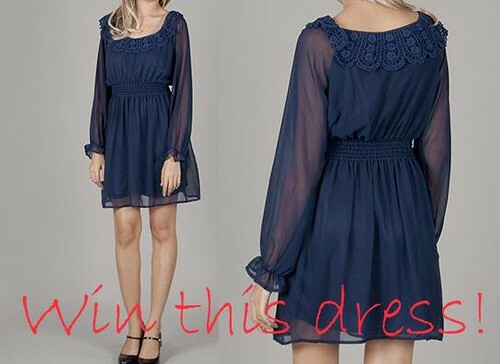 Prize #2: I received this navy chiffon crotchet dress c/o of Club Couture. Unfortunately, it was a tad short on me. The length would be perfect for someone who is around 5 ft tall. I also have a couple of dresses in similar style so I am giving this dress away as the second prize. This dress is a size small and the length measures 29 inches. 2. Leave a comment below letting me know which prize you'd like to enter. To be fair with everyone, I will verify all entries. Winner will be chosen on Tuesday 07.18 along with a new giveaway announcement. Please enter me for prize #1! I would like to enter for prize #1 please! Thank you! Please enter me for prize number 2 :) It is fabulous! Enter me for prize #2 please! Hello. Wonderful giveaway. Prize #2 please. Thank you! Please enter me for prize #2. Thank you! P.s. Very generous of you to give your own things away. enter me for prize #1!! unfortunately i'm probably a bit too tall for the dress so i'll enter for Prize # 1! Please enter me. Ashley S.
awesome giveaway <3 i wish i was a US resident ! love ur previous outfit post btw ! Enter me for prize #1 please!! Great giveaway! Entry for prize #1 please. Enter me for #2 please. thank you. i would love prize #1! thanks!